I've decided to join the forum so I can post responses. Stay tuned! Incidentally, Andrew Gough managed to score an interview with Manchester and Farrant. As I've previously pointed out, VRS member "Arminius Vámbéry" has no qualm in making light of David's deformity. The Hunchback was born on the border of Crouch End and Highgate, London, on 23 January 1946, some believe (though this is unconfirmed) at six minutes past six o'clock in the morning. It was discovered he was foetally-hunched. So why does Vámbéry keep his Farrant-fixiated blog hidden? So why doesn't he disclose The Hunchback of Muswell Hill on his list? Is it because he's ashamed of it? Is there a more sinister reason? And, if that blog is hidden...how many others might he have tucked away? Can you believe that the VRS actually "hires" people like this? Well, well, well. Isn't this interesting. rather timely that Manchester has gone and made himself another blog: Path of Reconciliation. See if you can guess who the warped, Photoshopped chap in "Hate (Emily Dickinson)" and "Resentment (Joseph Wardy)" happens to be. The answer was, of course, David Farrant. But, you wouldn't know this now, as the images have been changed! Check it out for yourself ("Hate (Emily Dickinson)" and "Resentment (Joseph Wardy)"). Once again, I'm thankful that I save the webpages I cite. So, if any reader doubts that there were "warped, Photoshopped" images of David in the Bishop's blog entries, I'll happily reproduce the proof here. Who Turned It Up First? It was "turned up" on the Vampire Research Society's blog long before it did on "Baldry Cat's" excuse of a blog to fuel Farrant's vendetta against Seán Manchester. He then goes on to quote chunks from an entry (which I had to look up myself, as Dennis was too lazy to provide it) on his Vampire Research Society blog. There are, however, primary differences between John Baldry Cat's use of the article, and Dennis'. The most obvious one, for starters, is that Dennis didn't link to the review he quotes chunks from. John Baldry's Cat did. Dennis also doesn't cite the reviewer's name, merely referring to him as "The person who was editor of the Hampstead & Highgate Express in those far off distant days". John Baldry's Cat actually cites his name, i.e., Gerald Isaaman. But most tellingly, Dennis omits Isaaman's negative criticisms of the Highgate Vampire Case. John Baldry's Cat, however, prints them in all their glory. Dennis boils down Isaaman's comments to his description of Manchester's appearance ("Manchester arrived at the office wearing a black cloak lined with scarlet silk and carrying a cane"), to which Dennis adds: "He forgot to mention the top hat and tails that were included with the opera cloak and cane." Dennis also provides Isaaman's overview of the Highgate Vampire story, but not Isaaman admitting he found it to be "a real hoot, and we played the story for laughs." So, sure Dennis, quotes from Isaaman's review turned up in your blog prior to John Baldry's Cat's mention. But, at least John Baldry's Cat had the temerity to link and cite the damn thing rather than omit Isaaman's criticisms and his name! Thus, John Baldry's Cat's coverage of the review was far more substantial and worthwhile than Dennis' own piddling extracts. John Baldry's Cat discusses one of the latest anti-Farrant blogs issued from the Vampire Research Society. It's called The Hunchback of Muswell Hill and was created by Arminius Vámbéry, who obviously has no sensitivity towards people who suffer from kyphosis. a trained and seasoned researcher of the arcane, the paranormal, and especially those dark areas of humanity where few dare to venture, namely vampirism and demonolatry. John Baldry's Cat turned up a rather interesting book review from the Camden New Journal. Steve Roud's London Lore: The Legends and Traditions of the World’s Most Vibrant City (2009) is the subject. The reviewer is Gerald Isaaman, who, as it happens, was the editor of the Ham & High when the Highgate Vampire first hit the Press. He candidly admits the Case was "a real hoot, and we played the story for laughs." Then, as Mr Roud recounts: "The rapid escalation of media coverage, from local press to national press to national television, turned a small local event into a major flap. It was the TV coverage that did the real damage, by airing reports with a spurious 'let the viewer decide' angle, and giving some very silly ideas a national platform." So it was that publicity provided the oxygen to keep alive a fictional story of a vampire terrorising Highgate, and one that exists today, long after after so-called expert scientific investigations, books galore and outrageous new explanations have, literally, gone round the world. Despite the seeming headway made during the course of the "Tea for Two" saga on The Cat's Miaow, it's no surprise that Team Farrant and Team Manchester have been at each other's throats. Again. This time, their ire was redirected to this thread on Andrew Gough's Arcadia Discussion Zone. John Baldry's Cat gave it some coverage here and here. Thus, it's rather timely that Manchester has gone and made himself another blog: Path of Reconciliation. It's been a while since I've signed into this thing, but after all the garbage that piled up, I'm sure you can't blame me. I did notice 6 unpublished comments to my blog. I've tried to have them published, but Blogger isn't letting me for some reason. Thank goodness for comment notifications. The comments will be reproduced within this post instead. Hi Anthony - Trystan from Righteous Indignation Podcast here (www.ripodcast.co.uk). I spent Saturday at an event related to ghosts, ghouls and all things strange. It just so happened that David Carter-Green was present and I ended up having a good chat with him about the whole Highgate thing. He came across as a very articulate and pleasant man who treated the situation with a good sense of humour. In regard to being friends or followers of anyone on Facebook as being some badge of allegiance I would reconsider. I am Facebook friends with David Farrant and also, until recently, with Sean Manchester. I only removed the latter after he threatened to get our podcast website closed down. I think David's response to the bishop's "offer" was a joke, i.e. "Sure, I'll with meet you, if your internet alter ego is there too." Probably safe to say he never intended to show up on the man's doorstep and risk it being interpreted to authorities as harassment. I don't know the actual details, but it seems Sean and David have a past history of legal court proceedings with charges and counter changes going back several years that featured accusations of "harassment" from both sides. It should be known that Seán Manchester has cut all ties with David Carter-Green who was summarily expelled from groups associated with Seán Manchester which Carter-Green had joined. The reason for the expulsion is an increasing number of worrying comments posted by Carter-Green on inappropriate groups. Concern arose solely due to the fact that Carter-Green has always portrayed himself as a devout Christian who belongs to the Orthodox Church. The impression being given to Seán Manchester was at odds with the activity and behaviour Carter-Green was displaying on Facebook and elsewhere. "Have you tried my new line in aftershave, DCG's 'Stench of Death'? It combines the distinctive yet subtle smell of the mortuary, with just a hint of freshly dug grave. It's proved very popular with heavy metal rock fans." 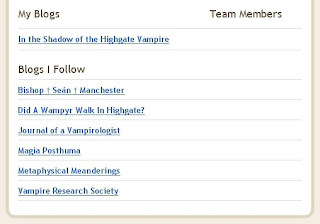 What Carter-Green is now claiming about his non-endorsement of Seán Manchester's views on vampires contradicts what he has written on paranormal websites he has joined that are independent of the Vampire Research Society and Seán Manchester. It should be made absolutely clear that Carter-Green made all the approaches to Seán Manchester and groups associated with the latter. How he ever became an admin on one or two of them is a mystery and clearly a mistake now rectified. Carter-Green has shown erratic behaviour in the past where he criticised Seán Manchester's account of the Highgate Vampire case, and then, some time later, endorsed it on paranormal websites. Mounting anomalies and instability where David Carter-Green is concerned made his expulsion inevitable. He is therefore no longer the concern of anyone associated with Seán Manchester. Seán Manchester has cut all ties with David Carter-Green who was summarily expelled from groups associated with Seán Manchester which Carter-Green had joined. The reason for the expulsion was an increasing number of worrying comments posted by Carter-Green on inappropriate groups. Concern arose solely due to the fact that Carter-Green has always portrayed himself as a devout Christian who belongs to the Orthodox Church. The impression being given to Seán Manchester was at odds with the activity and behaviour Carter-Green has been recently displaying on Facebook and elsewhere. Carter-Green has show erratic behaviour in the past where he criticised Seán Manchester's account of the Highgate Vampire case, and then, some time later, endorsed it on paranormal websites. Ironically, Seán Manchester had already cut all ties with David Carter-Green who was summarily expelled from groups associated with Seán Manchester which Carter-Green had joined. The reason for the expulsion is an increasing number of worrying comments posted by Carter-Green on inappropriate groups. Concern arose solely due to the fact that Carter-Green has always portrayed himself as a devout Christian who belongs to the Orthodox Church. The impression being given to Seán Manchester is at odds with the activity and behaviour Carter-Green has been displaying on Facebook and elsewhere. Yes I see I am still listed as one of Sean Manchester's 'followers' on his website. I did try and delete my name from it but was unable to!